I recently discovered a little 2-week old Korean eatery tucked away at Ridgewood Close. I don't even know the name of the shop as it was written in Korean! We popped in intending to have a simple lunch, and were blown away by the surprisingly tasty home-cooked flavours. 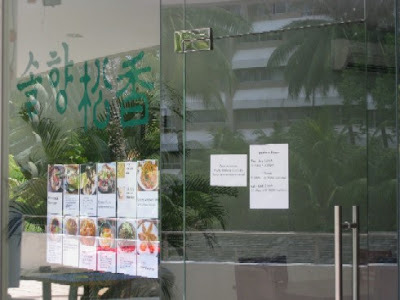 Certainly no Nong Shim instant noodles served here (although I like that too. haha) As we tucked into our noodles, bowls and bowls of little side dishes were brought out for us. 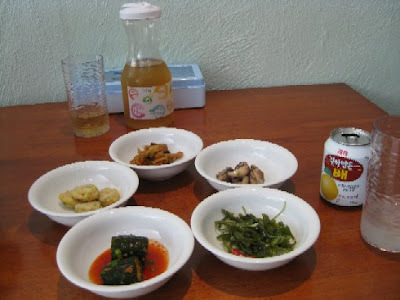 Different variations of kimchi, fish cakes and seaweed. All very nice indeed. 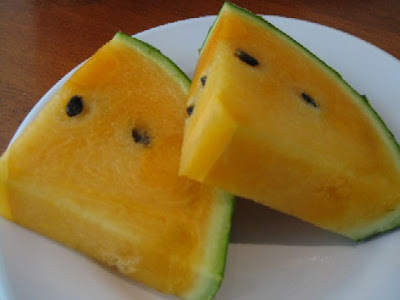 We also had a refreshing chilled flask of Korean green tea presented to us, and slices of deliciously juicy and sweet yellow watermelons. Check out how thin the skin was!